Francisco Solano ﻿﻿immigrated ﻿﻿to Los Angeles from his native Costa Rica along with the family of Antonio Casanova and María Trinidad Serrano Puentes and their three daughters, María Agustina, María Rosa de las Mercedes, and María Teodora. Francisco, a butcher by trade, set up a meat-packing business in Sonora Town, just north of the Plaza. 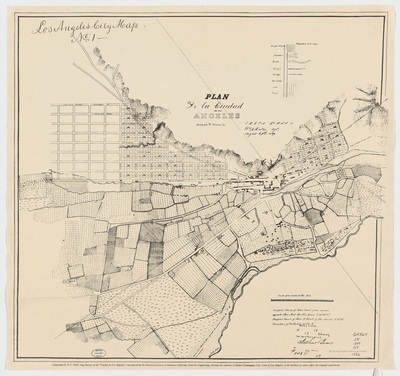 Also in 1849, U.S. Army Lt. E. O. C. Ord was commissioned to draw what is considered to be the first map of Los Angeles. 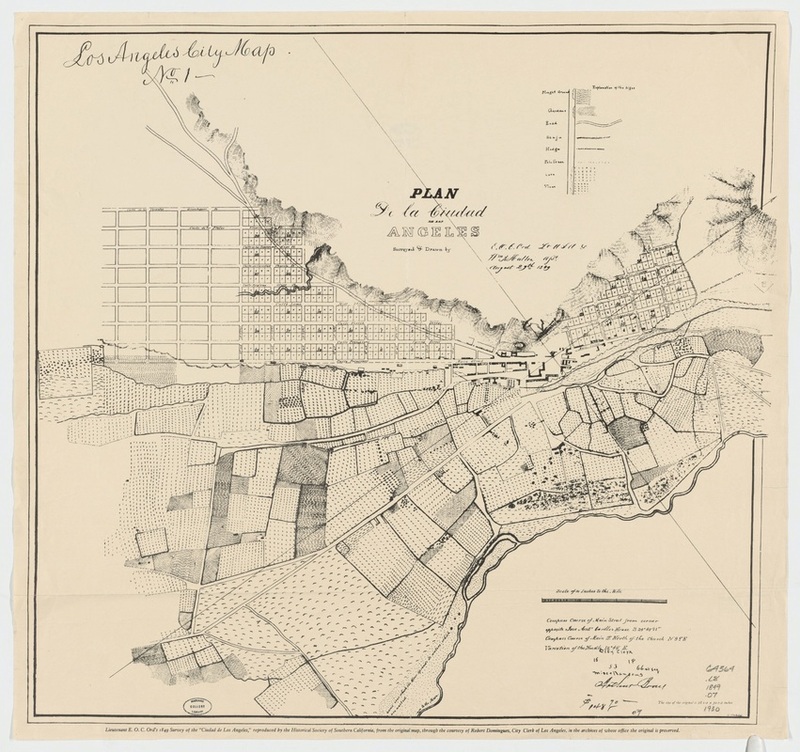 Ord's map was the basis from which subsequent maps of Los Angeles were drawn as the limits of the city were extended. Antonio Casanova, originally from the province of Cataluña in Spain, died in Los Angeles. Antonio, along with his wife, Trinidad Serrano, and their three daughters, and accompanied by Francisco Solano, arrived in Los Angeles sometime between 1847 and 1850. ﻿﻿Francisco Solano married María Rosa de las Mercedes Casanova, one of the daughters of Antonio Casanova and Trinidad Serrano Puentes. 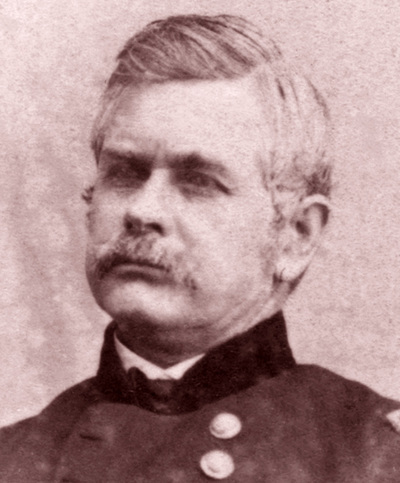 Juez de paz William G. Dryden performed the civil ceremony. Francisco Solano and Rosa Casanova were married a second time, this time in the Plaza Church. Their family eventually included six children: Josefina (1855), Alfredo (1857), Alejandro (1859), María Agustina (1861), Manuel (1863), and Alonzo Francisco (1866). 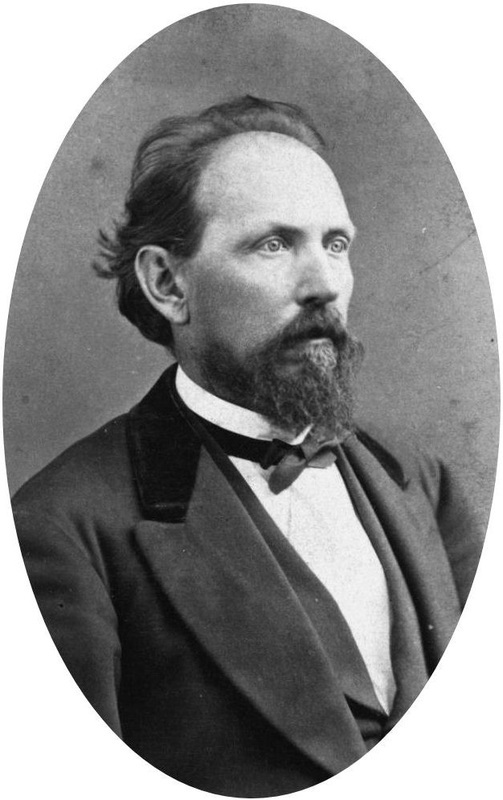 The birth of Alfredo in 1857 was instrumental in the development of present-day Solano Canyon. The photograph on the left (below) is probably the earliest known photograph of the Plaza, taken in the late 1850s or early 1860s. Prominent in the right background of the photograph is el Aliso, the then-400-year-old sycamore tree growing in the fertile soil on the western bank of the Los Angeles River. The tree was sacred to the indigenous Tongva culture and was a meeting place for their nearby village, Yang-na. On the right is a view from about the same time, looking across Sonora Town up Calle Eternidad toward Calvary Cemetery (hence the name — "Eternity Street", in English) and beyond, toward the Stone Quarry Hills, where the Solano Canyon community would ultimately be located. September 13, 1866 was a pivotal date in the history pf Solano Canyon. It was on that date that Francisco Solano purchased three tracts of land from the City of Los Angeles: a 17-acre lot and two, 35-acre lots in what was known as the Stone Quarry Hills, northeast of the City. 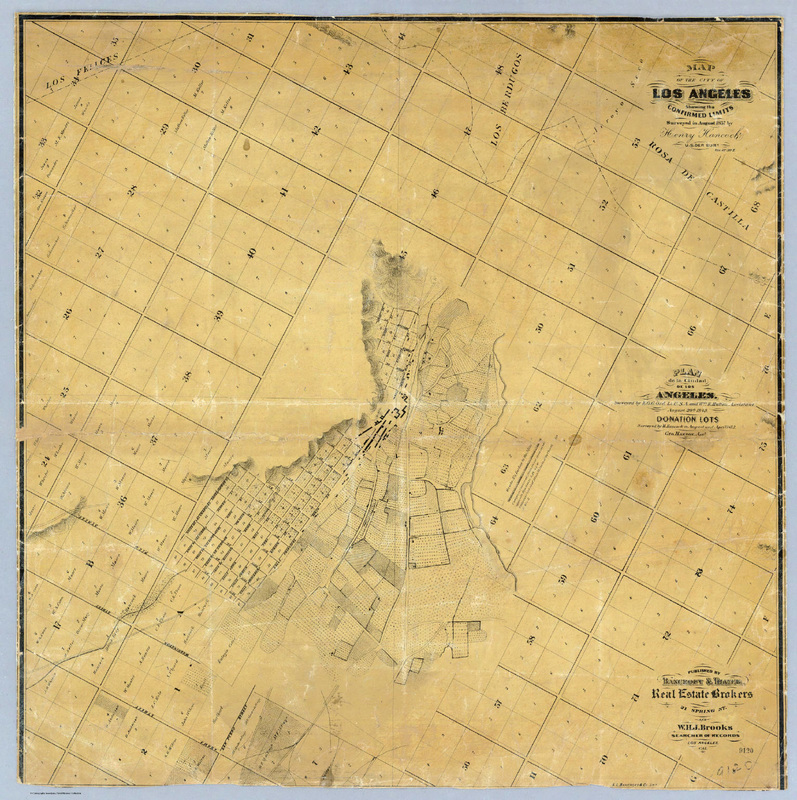 Those 87 acres, combined with an additional 52½ acres that were owned by Francisco's daughter, María Agustina, and her husband, Guillermo Bouett, was the land on which the Solano Canyon community, along with all of la Loma and Bishop and about half of Palo Verde, were developed. 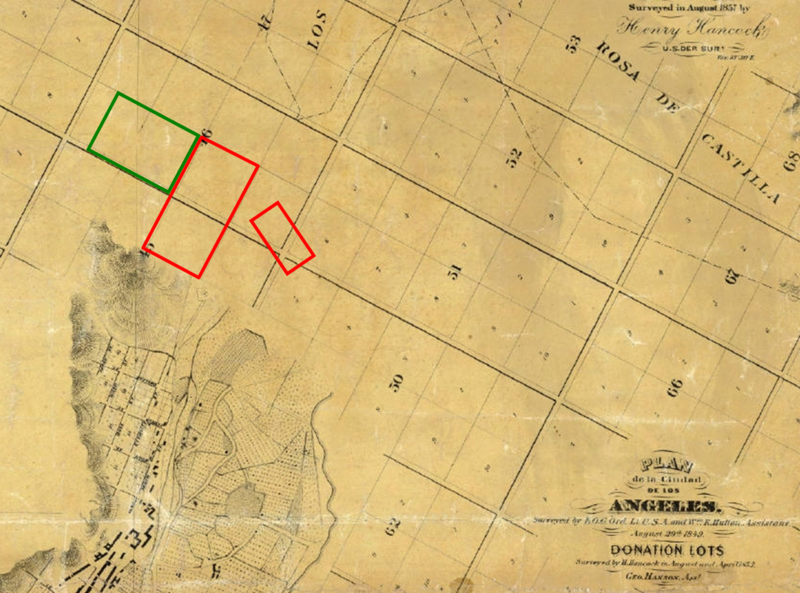 In the left-hand image, above, the large block is a 35-acre tract that Francisco Solano attempted to purchase from the City, but he was only granted the right to purchase 17 acres — the smaller block inside the larger one. At the left in the same image is Calvary Cemetery, and between them is one of the several reservoirs in the Stone Quarry Hills. 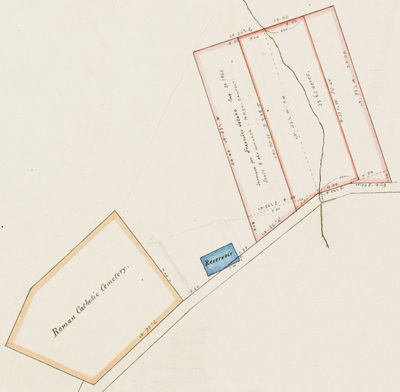 The right-hand image is taken from H. J. Stevenson's 1884 map. 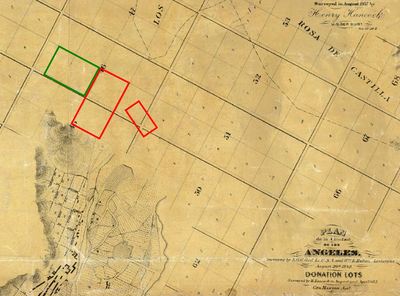 The three blue parcels marked 'Solano' are the 87 acres that Francisco Solano purchased on September 16, 1866. The orange parcel, marked 'Hansen & Hellman', was originally owned jointly by George Hansen and I. W. Hellman. Hellman sold his interest to Hansen, who in turn sold one-and-a-half parcels — 52½ acres — to María Solano and her husband, Guillermo Bouett. 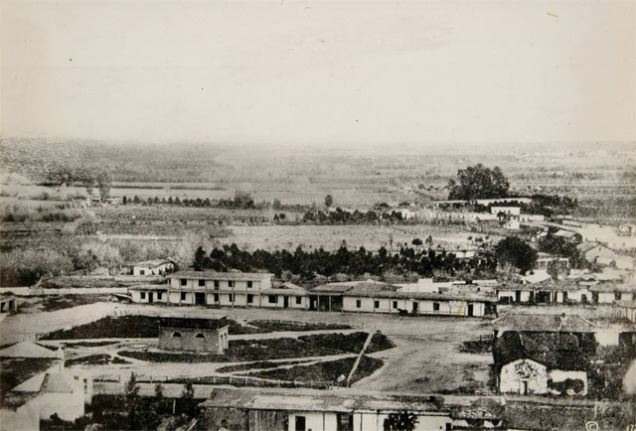 The combined 139½ acres, including Solano and Cemetery Ravines and the loma between them, was the land on which Solano Canyon and the Chávez Ravine communities were built. Francisco Solano immediately built an adobe on his 17-acre parcel on a small stream that was fed by a spring higher up in Solano Canyon. He moved his family from Sonora Town to the adobe, and the family lived there until Francisco died suddenly in 1871. He was buried in Calvary Cemetery, only a few yards from his adobe in Solano Canyon. 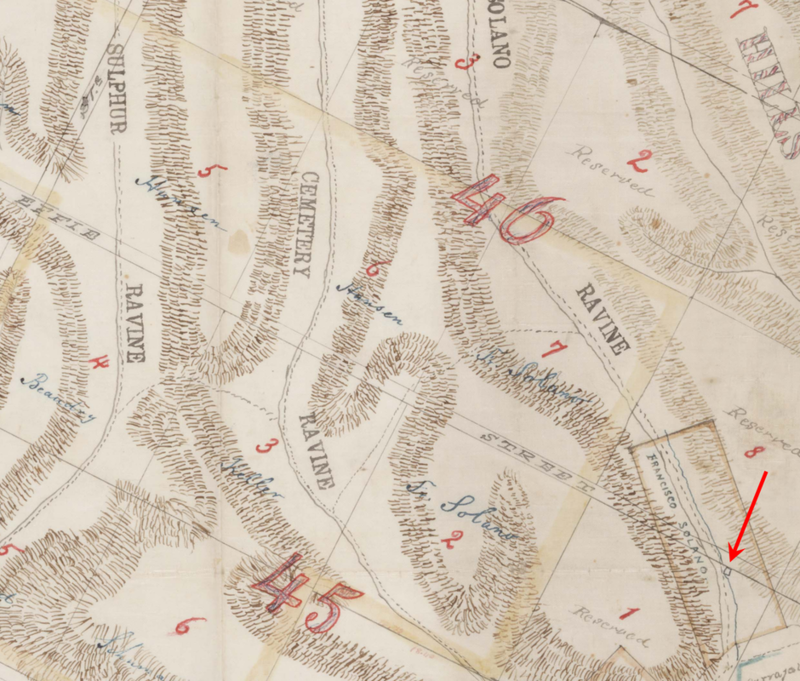 The red arrow on George Hansen's 1868 map, below, points to the location of the Solano adobe on the stream in the ravine. Francisco Solano died suddenly on December 7, 1871 at the age of 54, leaving his widow, Rosa Casanova, and their six children in the adobe on the stream in Solano Canyon. 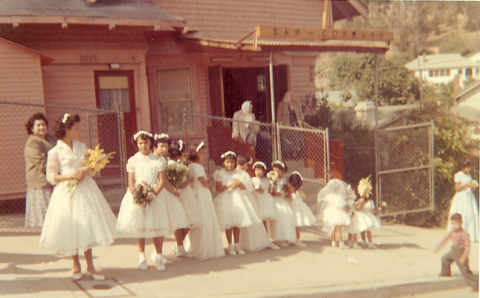 Rosa Casanova moved her family to the home of her mother, Trinidad Serrano, on Bath Street near Downtown Los Angeles. Although Alfredo Solano was only 15 years old when his father died, he refused to consider selling the family's land in Solano Canyon. 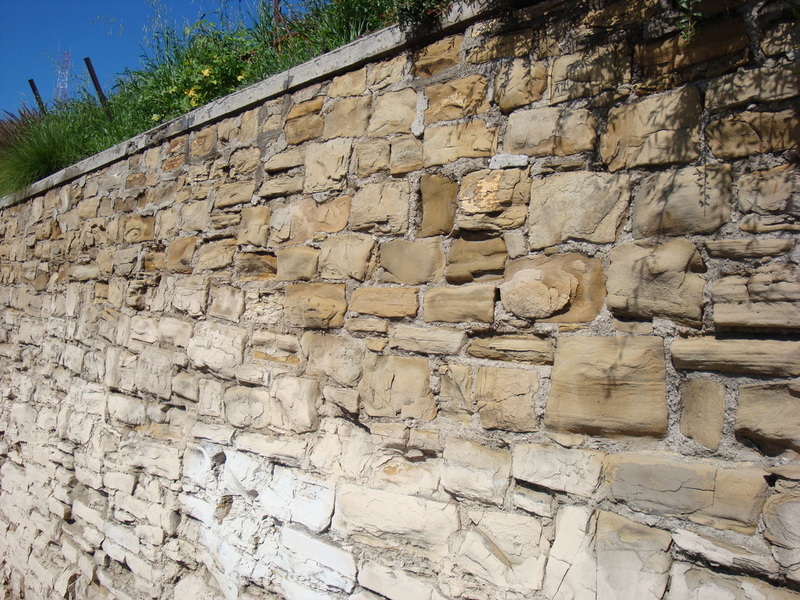 He continued to work with his mentor, civil engineer and surveyor George Hansen, learning the surveying trade. 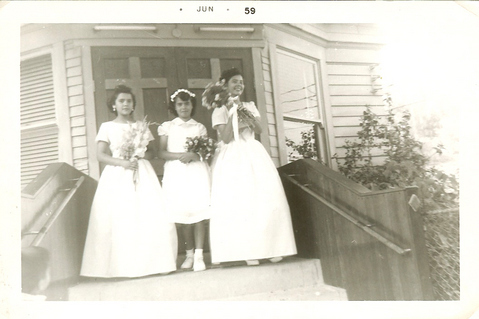 Alfred's grandmother, Trinidad Serrano (at left), the widow of Antonio Casanova, continued to live in Los Angeles, and she died there in 1888 at the age of 81. Rosa Casanova, widow of Francisco Solano, married Agustín Ferlin. 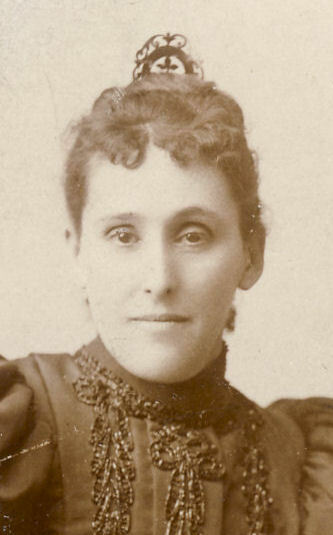 Their daughter Laura, born in 1879, became the ward of Alfred Solano following the death of their mother, Rosa Casanova, in 1884. Laura later took the surname Solano as her own. María Agustina Solano, Alfred's younger sister, married Guillermo Bouett. They eventually became the owners of a 52½-acre tract that adjoined the 70-acre tract that was a part of the original purchase by Francisco Solano in 1866. Bouett Street in Solano Canyon is named for María. Guillermo Bouett was a Captain in the Los Angeles County Sheriff's Department. He was killed in the line of duty in 1913. 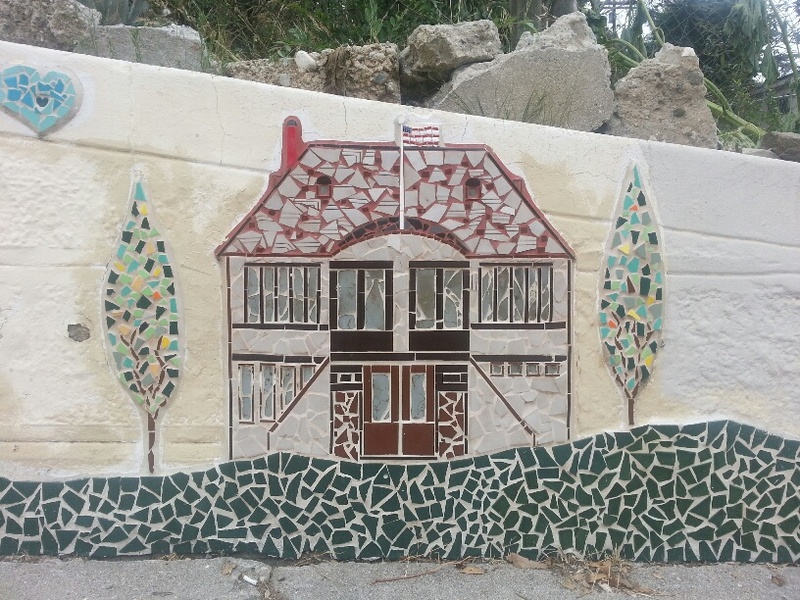 María Solano and Guillermo Bouett built a home on a lot at the corner of Buena Vista and Casanova Streets. A retaining wall, built of native stone quarried from the Stone Quarry Hills, still stands at the site. Rosa Casanova, widow of Francisco Solano and mother of the six Solano children, including Alfred, died suddenly on the family farm at Rancho Tajauta at the age of 44. Following the death of his mother, Alfred began making plans to secure the legacy of the family's land in Solano Canyon. Rancho Tajauta, which was considered the Solano family farm, was located about 12 miles south of downtown Los Angeles and is the land that became the community now known as Watts. 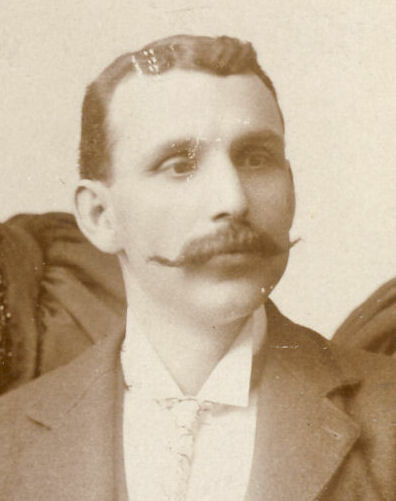 Alfredo Solano married the widow Ella T. Brooks in New York. 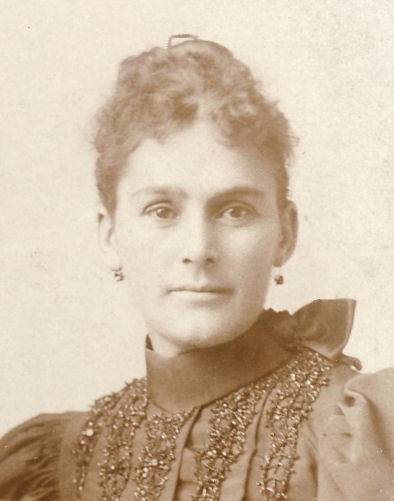 One of Ella's daughters, Marion Patterson, later married the physician Walter Jarvis Barlow, who founded the Barlow Sanatorium on Chávez Ravine Road in 1902 and for whom Jarvis Street in Solano Canyon is named. 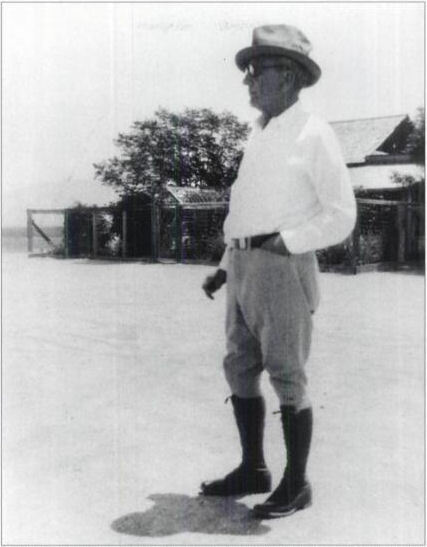 Alfred and Ella Brooks Solano were major patrons of the Barlow Sanatorium. Brooks Avenue in Solano Canyon is named for Alfred's wife, Ella T. Brooks. 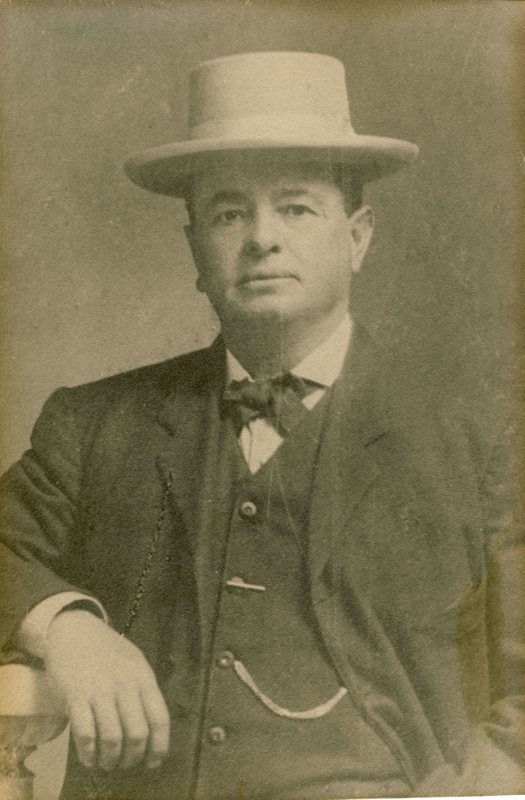 Alfredo Solano, or Alfred as he was then known, son of Solano Canyon founders Francisco Solano and Rosa Casanova, had, by 1888, been both Los Angeles County and City Surveyor. He, along with George Hansen, his mentor, were partners in the engineering and surveying firm Hansen & Solano. 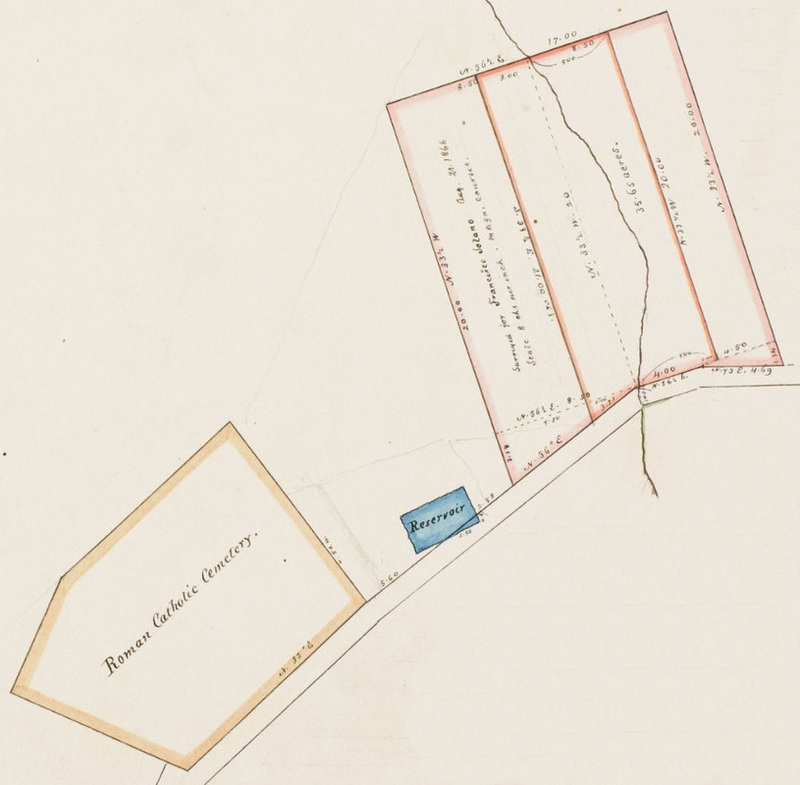 Alfred, in an effort to preserve his parents' land, surveyed and subdivided the 17-acre parcel that lay between what is now the Arroyo Seco Freeway (CA-110) and North Broadway into 100 lots, which were then distributed among the heirs. 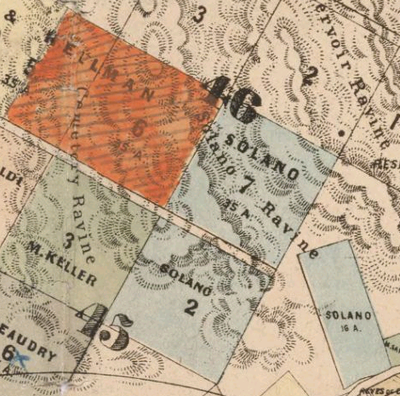 This parcel was known as the Solano Tract. The remainder of the Solano property, 70 acres, was held collectively in undivided interest by the heirs. 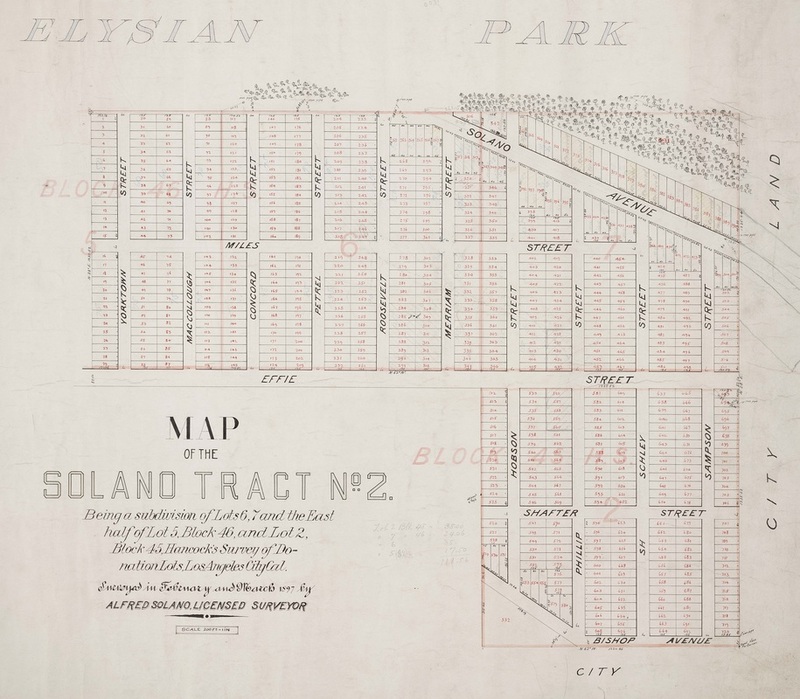 Several family members elected to sell their lots in the Solano Tract immediately, and Alfred purchased many of those lots himself from his siblings. House construction began almost immediately, and by the census of 1900, there were 52 households in Solano Canyon: 8 on Buena Vista Street, 10 on Casanova Street, and 34 on Solano Avenue, for a total of 197 people. Access to the Solano Tract was via Buena Vista Street, which at the time ran from just north of Downtown to the Los Angeles River. 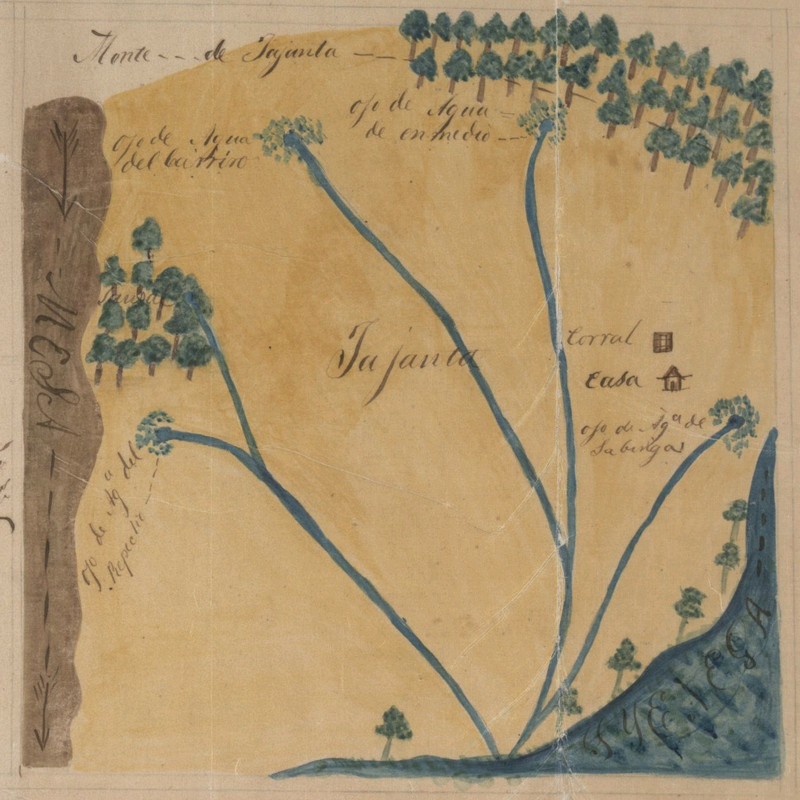 A close look at the map reveals the stream (the blue line) that flowed from the spring high on the 17-acre tract, on which Francisco Solano built the adobe home for his family. The two streets in the new subdivision were Solano Avenue and Casanova Street, named for Alfred's parents, Francisco Solano and Rosa Casanova. 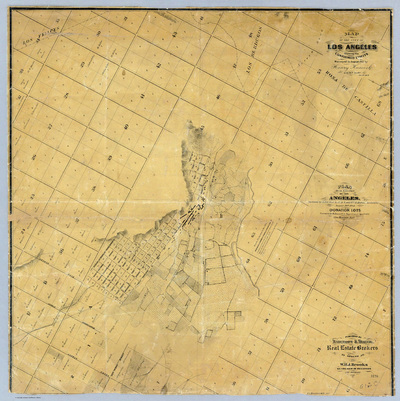 The new tract contained a staggering 720 lots, which, if it had been built out at the rate that the 17 acres was built, would have contained more than 2,700 people. 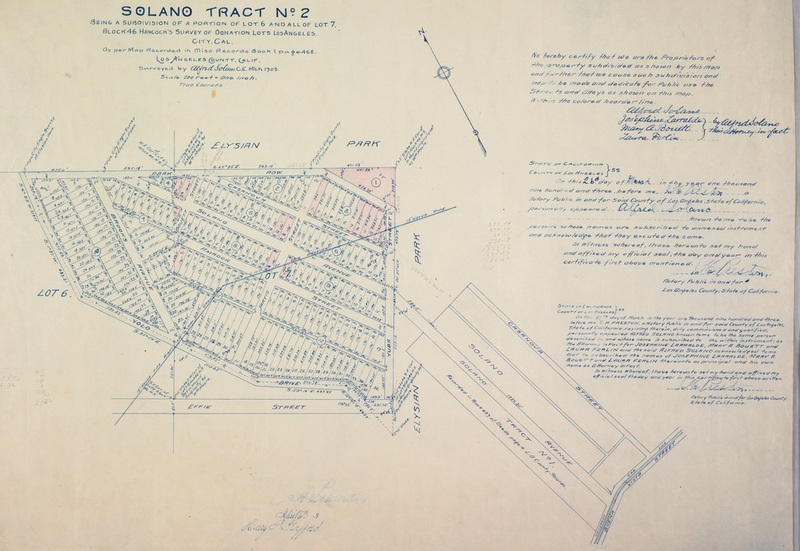 But the terrain was very steep, and Alfred quickly realized that he could not subdivide the entire property as he had imagined, so he revised his plan and produced a new map of what became Solano Tract No. 2. 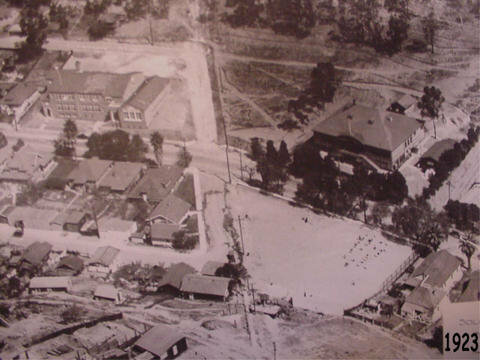 Due to "fearful overcrowding" conditions in the Los Angeles public schools, a bond issue was passed in early 1903 to build 18 new schools. One of the new schools was the Solano Avenue School on Solano Avenue in Solano Canyon. It was one of the smaller schools in the group, with four rooms plus some site work, and the value of the contract was $12,500. The architectural contract was let to the firm of Hudson & Mansell, a well-known Los Angeles architectural firm that a year earlier had donated its services to draw up the plans for the new Barlow Sanatorium on Chavez Ravine Road, of which, Alfred Solano and his wife, Ella Brooks, were patrons. 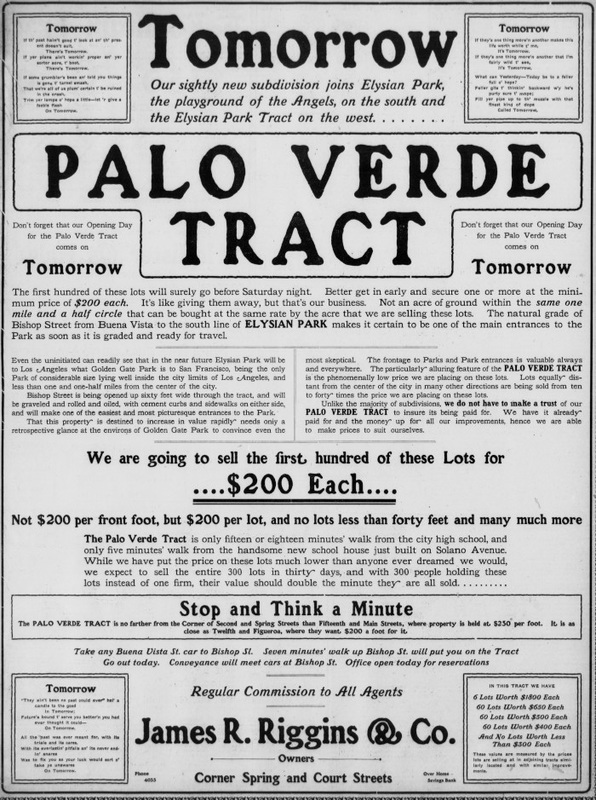 The Palo Verde Tract was sold to real estate developers James R. Riggins & Co., who began an intensive newspaper campaign to sell lots in the tract, beginning in February, 1905. Sales were brisk, and by the census of 1910, there were 37 new houses in Solano Canyon, plus 24 houses in the adjoining community of la Loma. Buena Vista Street, from the Los Angeles River to Sunset Boulevard, was renamed North Broadway, and addresses on Buena Vista Street were renumbered to accommodate the change in the street name. The name Buena Vista Street disappeared altogether in 1912, when it was renamed North Broadway from Sunset Boulevard to its terminus to the southwest. 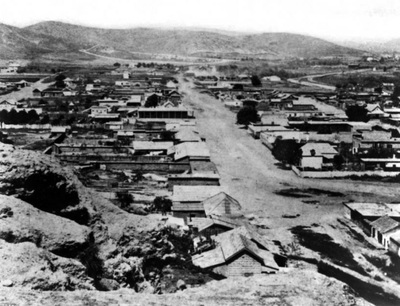 The 1910 census showed that there were 120 families living in Solano Canyon, for a total of about 450 people. 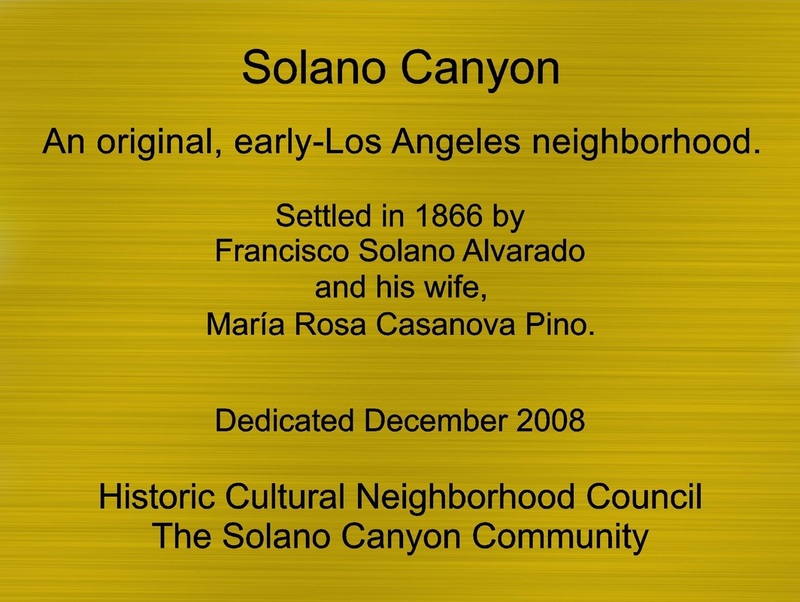 By the 1920 census, the number of families in Solano Canyon had increased to 203 and about 750 people. Solano Canyon continued to grow. By the 1930 census, there was a house on nearly every available lot, with a total of 309 families and more than 1,100 people. 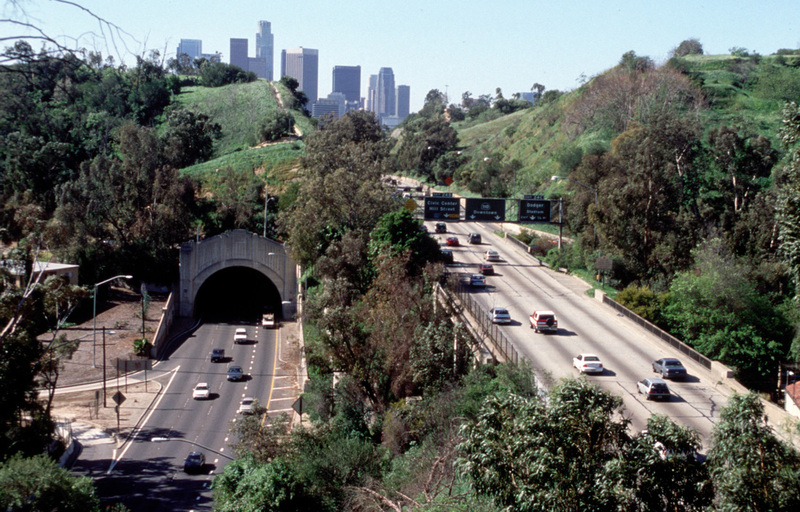 The completion of the first three of the four Figueroa Street tunnels, which opened in 1931, allowed traffic from Pasadena and the east to have nearly-direct access to downtown Los Angeles. Westbound traffic on the combined California Highway 11 and U.S. highways 66 (the historic 'Route 66') and 99 exited the three tunnels and turned left down Solano Avenue to North Broadway, and thence to downtown. The resulting Arroyo Seco Parkway, however, effectively cut Solano Canyon in two. 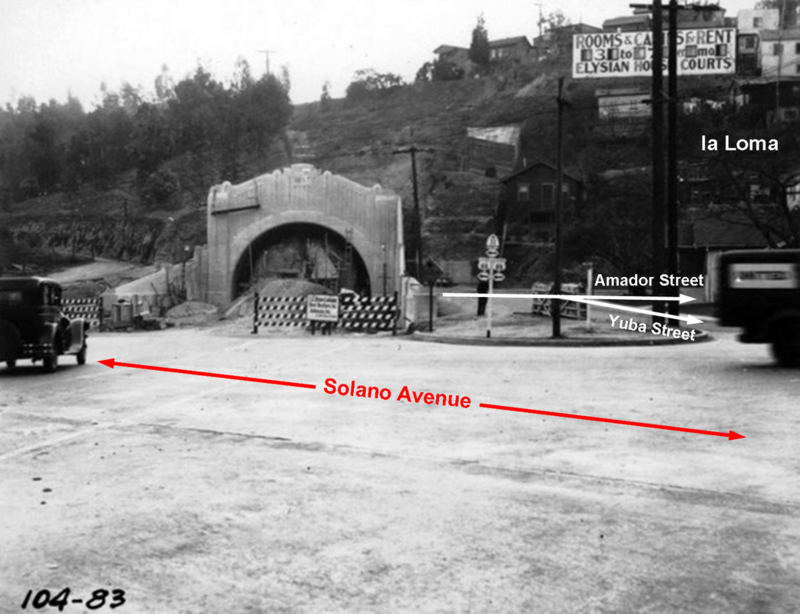 The image below shows the left turn from the Arroyo Seco Parkway onto Solano Avenue. Under construction in the background is the fourth Figueroa Street tunnel which, when it opened in 1936, provided direct access to downtown Los Angeles from the East. 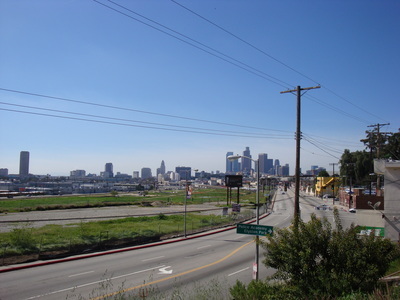 Westbound traffic was no longer required to use Solano Avenue for access to downtown Los Angeles. The Arroyo Seco Parkway became the Pasadena Freeway in 1940. It was the first modern freeway in the western United States, and it is still in use today. The 1940 census showed that the population of Solano Canyon had remained constant at more than 1,100, with 303 households. A six-room, two-story house, originally built by William Hays in 1905 and located at 616 Solano Avenue, across from the new Solano Avenue school, was given to the Catholic Church by Señora Juanita Rodela and her daughter, Francisca Schutte, and relocated to an empty lot at 1809 Bouett Street, which was also donated to the church by the same mother and daughter. The building was demolished in 1971, and the address is currently an empty lot on Bouett Street, across from the San Conrado Church. Southbound lanes were added to the Pasadena Freeway in 1943, much of it elevated; before that, traffic traveled in both directions through the four Figueroa Street tunnels. This contemporary view, looking West, shows the freeway passing through Elysian Park just east of Solano Canyon. The Dodger Stadium exit, visible in the photograph, empties onto Casanova Street, since renamed Academy Road. With the completion of the elevated, westbound lanes of the Arroyo Seco Parkway, Amador Street was extended to the southeast and intersected to Solano Avenue so that the two parts of Solano Canyon could remain connected. The origin of the name of Amador Street remains unclear. 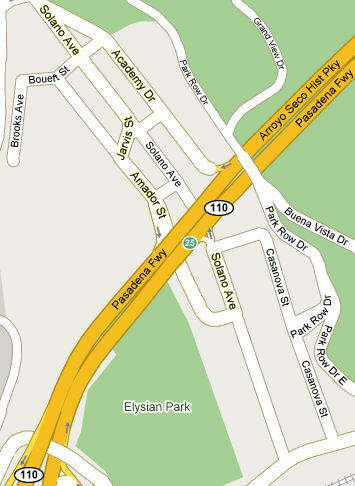 In order to provide additional access to Dodger Stadium, an offramp was built on the Arroyo Seco Parkway westbound at Casanova Street in Solano Canyon. That portion of Casanova Street was renamed Academy Road, since it provided access to the Los Angeles Police Academy and Dodger Stadium. The name change took place one month before Opening Day at Dodger Stadium in April, 1962. 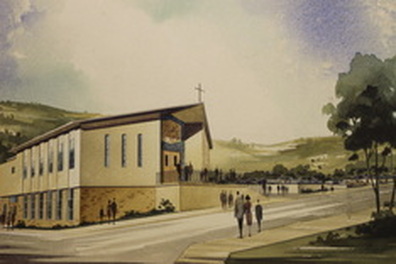 Almost exactly on the centennial of the founding of Solano Canyon, ground was broken for construction of the new San Conrado Church, located at 1820 Bouett Street in Solano Canyon. 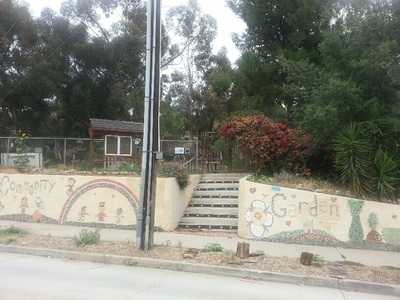 The residents of Solano Canyon established a garden on the site of the original Solano Avenue School. The nearly-five-acre garden features community and individual garden plots and an orchard. 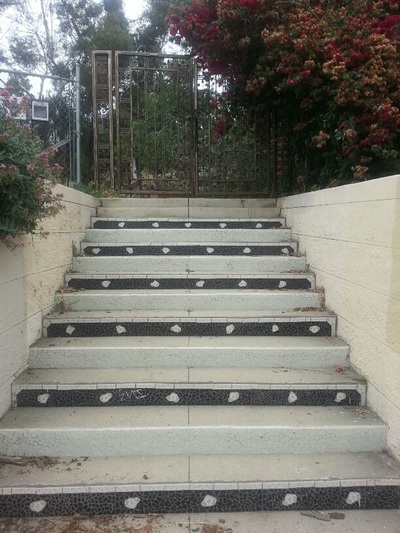 The Arroyo Seco Parkway runs alongside — and partly under — the garden; part of the orchard is actually situated on land above the second tunnel of the northbound lanes of the parkway (Tunnel 3). 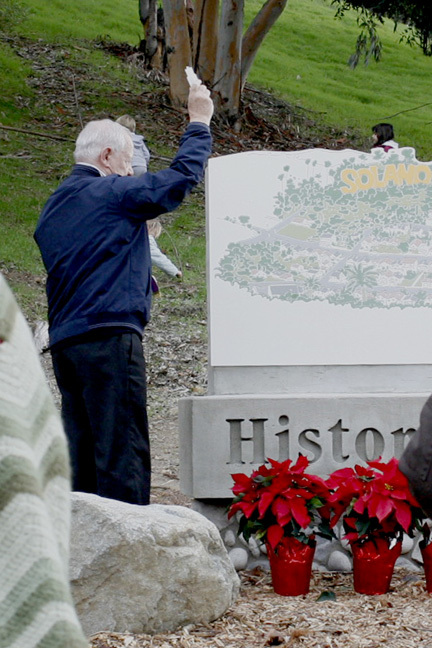 Residents of Solano Canyon dedicated a monument recognizing the Historic Neighborhood status of Solano Canyon. The monument is located at the northwestern entrance to Solano Canyon on Solano Avenue. 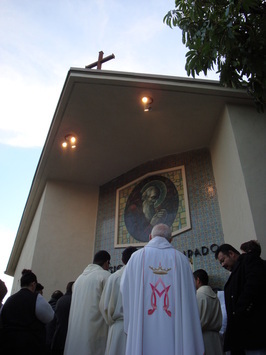 It was designed by local residents, and the priest from San Conrado Church blessed the monument as part of the dedication ceremony that was well-attended by the community, and which included speeches from local officials, several residents, and a Justice of the California Supreme Court. 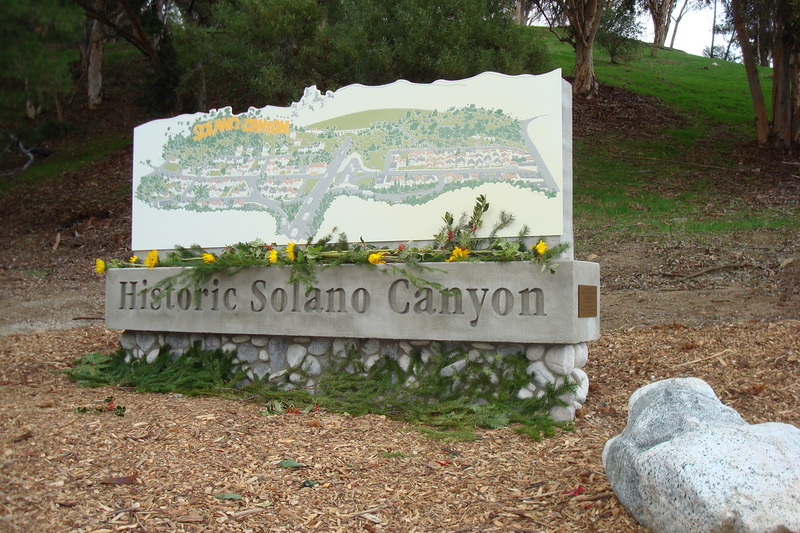 The historic status of Solano Canyon is being commemorated this year by the construction of a bus stop on North Broadway at Solano Avenue. 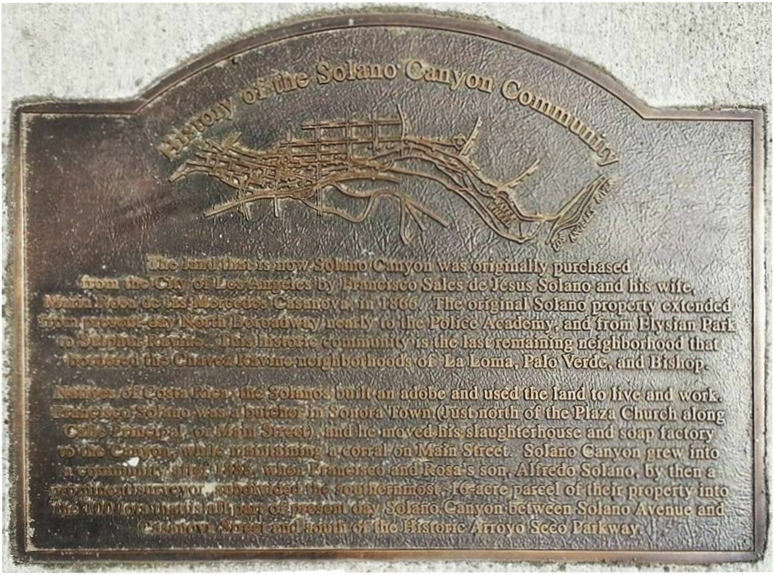 The bus stop features a bronze plaque that describes the history of Solano Canyon, along with a patterned crosswalk. Care to contribute to, or correct and entry in, the timeline? Feel free to contact us here with your comments or suggestions.